On base of pedestal: "f. franckIN cf A / 1622." 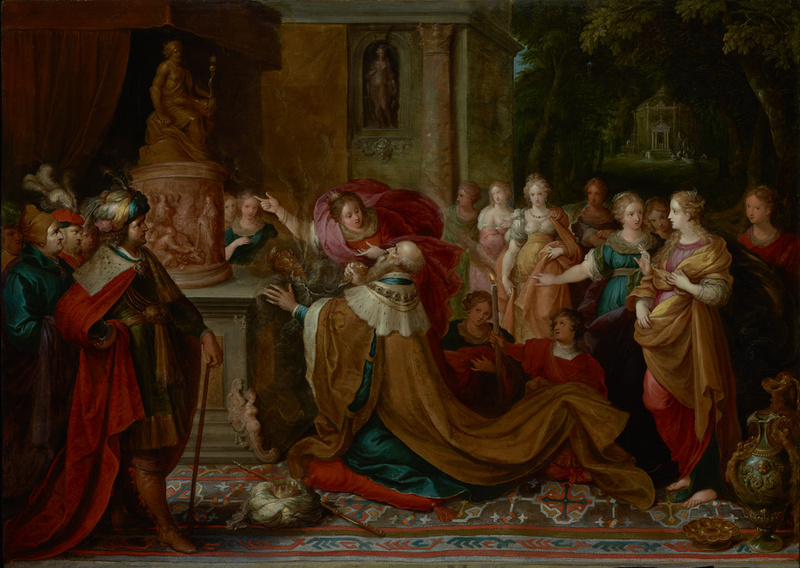 Wearing a magnificent silk robe with an ermine lining, King Solomon kneels and makes an offering to a pagan idol. One of his wives appears to instruct him, while several other concubines, lavishly dressed, stand behind. A group of men in elaborate headpieces and rich finery watch Solomon and the women from the left with displeasure, as if they know that Solomon's idol worship will eventually destroy his kingdom. The Temple of Jerusalem, which was erected under the king's reign, is under construction in the background. Solomon was known for his proverbial wisdom and great wealth. In his later years he was increasingly drawn to the pagan cults, which were thought to have been introduced into Israel by the women who came from neighboring kingdoms to join his large harem. This subject was popular in Protestant countries in the 1600s because it reflected Protestant disapproval of the Catholic Church's use of religious imagery, a practice that Protestants viewed as idolatrous. William J. Evans (Los Angeles, California) [unsold, Evans sale, Christie's, London, February 24, 1967, lot 2. ], sold to Edward R. Baker, 1970. Edward R. Baker (Costa Mesa, California), sold to the J. Paul Getty Museum, 1971. Christie, Manson & Woods., Ltd., London. Catalogue of Ancient and Modern Pictures and Drawings from Various Sources. April 12, 1946, p. 12, lot 152. Christie, Manson & Woods, Ltd., London. Catalogue of Pictures by Old Masters. February 24, 1967, p. 2, lot 2. Fredericksen, Burton B. Catalogue of the Paintings in the J. Paul Getty Museum (Malibu: J. Paul Getty Museum, 1972), p. 66, no. 82. Härting, Ursula Alice. Studien zur Kabinettbildermaleri des Frans Francken II, 1581-1642: Ein repräsentativer Werkatalog (Hildesheim, Zurich and New York: Georg Olms, 1983), p. 90, no. A40, fig. 56. Pippidi, Andrei. "Essai d'un catalogue de l'oeuvre de Frans Francken II." Revue roumaine d'histoire de l'art 22 (1985), pp. 13, 28, cat. XI, no. 2. Härting, Ursula Alice. Frans Francken der Jüngere (1581-1642): Die Gemälde mit Kritischem Oeuvrekatalog (Freren: Luca Verlag, 1989), p. 246, no. 74, ill.
Capoa, Chiara de. Old Testament Figures in Art. Stefano Zuffi, ed. Thomas Michael Hartmann, trans. (Los Angeles: J. Paul Getty Museum, 2003), p. 251, ill.